My travel companion works a lot. He’s doing a stage which means long hours in exchange for knowledge and experience. That’s really great. He finds it rewarding and I’m naturally inclined to lots of solo time anyway. But one day, after quickly grabbing a subpar meal (seriously, how do you charge 10 euros for microwaved toasts) before his shift at the restaurant, I just wasn’t feeling it. 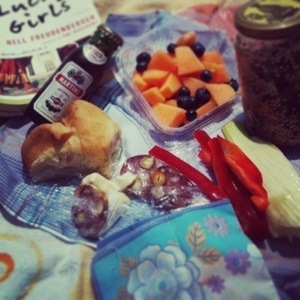 Rather than stay all Debbie Downer about it (but thanks Heather, Steph & Drea for indulging me for that hour or so) I thought I’d “treat myself” Joy the Baker style and take myself on a full-out picnic at the beach. Followed by a swim in the Mediterranean! That, my friends, is called turning feeling bummed into a blog post.